One grave we were taken to was a new one I hadn't seen before, although there has been much publicity about this one in recent months. The grave in question of LEE HOON LEONG. Now I know for Singaporeans out there, and many others, they will know immediately who this was and his significance in Singapore's history but, for those who don't here's why..... He is the Grandfather to Lee Kwan Yew. Without Lee Hoon Leong there would of been no Lee Kwan Yew and no Singapore as we know it today. Lee Hoon Leong 1871- 22.8.1942. 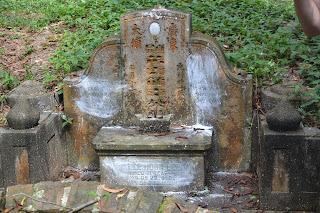 However look closely at the gravestone and you will see the date is written as 2602, this is because he died during the Japanese Occupation of Singapore. The Japanese then followed the Koki year which started in 660 BC in the reign of the Emperor Jimmu. Lee Hoon Leong was educated at Raffles School and later qualified as a dispenser before eventually becoming a purser for the shipping company Heap Eng Moh Steamship Co Ltd. He travelled between Singapore and Semarang in Indonesia where he met his first wife. He had a good relationship with the company owner 'sugar king' Oei Tiong Ham and in due course he was promoted to Managing Director of the company, amassing much wealth, this sadly was lost during the Great Depression. Lee Hoon Leong was married twice but his first wife Ko Liem Nio was the grandmother of Lee Kwan Yew. He had 3 sons Chin Yam, Chin Koon and Chin Tong and 5 daughters Choo Neo, Siok Neo, Leng Neo, Wee Neo and Kin Neo. So as you can see what appears just to be another grave amongst thousands of other within this cemetery has an important story behind it.